Hi, it’s Sharon today stopping by with a product highlight. I recently saw these plastic storage trays on special offer in my local supermarket and grabbed a couple to see if they’d be useful. When I got them home I realised they are the perfect size for quite a few crafty things. The ones I have are the small size, but they do have a selection of larger sizes too. They come in black, brown or cream and what I like about them is that they are pretty strong and sturdy, and have really useful handles at each end which means I can grab one easily and take it to my craft desk. Then I used a couple more to store my card blanks, and finished card samples. Here in the UK I picked them up for just £1.50 each in Morrisons so I’m just going to grab a couple each time I go food shopping. 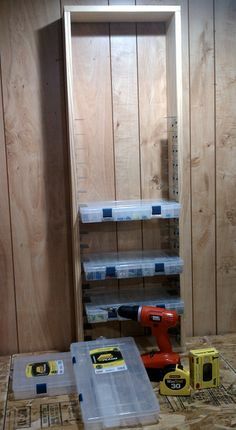 Since I’m in the process of building a new craft space I thought I’d find some shelving solution that works for them when I start planning the furniture. Curver are an international company so I’m pretty sure you’ll be able to find them wherever you are. Here’s a link to them on the US website and more details. I think I might try some of the other sizes to see what use they might have as I’m very impressed with the quality. Thank you for stopping by CSI! Happy Monday! It’s Cicily with a product review for the Pocket Scrapbooking Organizer from Organize More. I was so happy to get this desktop organizer for pocket page inserts. I’ve had something along this line in mind for my hubby to build, but this was much nicer then I could have imagined. With 13 cubbies and the ability to remove the dividers, you have lots of options to fit your needs. I also love that it’s not too big and bulky and it is actually light weight with little finger holds on the sides to easily move it. Plus with felt feet, it easily slides on your desktop. Ranger has just brought out a new storage container for the Mini Distress Ink Pads! This tin is a great solution if you like to take your supplies to crops. I’m sure many craft stores will be stocking this, or pop over to the Ranger website for more details. Thanks for stopping by Craft Storage Ideas! Hello! I’m highlighting a terrific Darice product today that is perfect for storing and color coordinating your sequins. This can be found in the beading aisle at your local Joann and also at their online store. There are 20 small compartments and one rectangle compartment, perfect for coordinating craft items or small tools. What I like most about this product is the clasp that closes it securely! May GIVEAWAY from Organize More! UPDATED! WINNER CHOSEN on 5/21/14! : #8 Suzanne Lowrie! Hi all! I cannot WAIT to share with you the wonderful giveaway that our friends from Organize More! are offering our Craft Storage Ideas readers for May! Look at this wonderful Combination Ink and Ribbon organizer that you could be sporting in your very own space! I love how it can accommodate different sizes of ink pads, don’t you? To win, please comment on this post, and tell us your favorite brand of ink pads and why. We will select a winner on May 21 and post on the Craft Storage Ideas website and Facebook page! One entry per person only, please. Due to the high cost of shipping, you MUST live in the continental US 48 states to participate, thank you for understanding! Author NoelleMcAdamsPosted on May 13, 2014 May 21, 2014 Categories Giveaway, Giveaways, Product HighlightTags Giveaways, ink pad storage53 Comments on May GIVEAWAY from Organize More!